England was relatively slow to begin settlements in North America, which stood small in the shadow of the vast Spanish Empire. Several halting attempts were made during the 1500s, most notably those of Sir Humphrey Gilbert and Sir Walter Raleigh. No settlements resulted from those early ventures and widespread interest in colonization did not begin to build until after the defeat of the Spanish Armada in 1588. The humiliation of Spanish power on the Atlantic brought a new confidence to English investors and adventurers. In 1606, King James I divided Virginia* between two groups of competing English merchants. Their charters proclaimed their intentions to spread Christianity, but in truth the primary motivation was the lure of gold and silver. 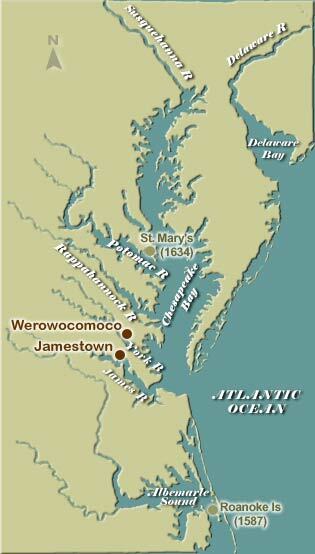 The Virginia Company of Plymouth was granted rights to the northern part of Virginia between 38º and 45º north latitude. This group made a feeble attempt at a settlement on the Kennebec River in what would later become Maine, but the tiny colony lasted only a few months. The Virginia Company of London, however, was better prepared to act on its rights to those lands between 34º and 40º north latitude, the southern part of Virginia. The fact that the chartered areas overlapped one another placed a special premium on speed. Under the command of Captain Christopher Newport, the London group dispatched three ships, the Godspeed, the Discovery and the Susan Constant. Departing in December 1606 and arriving in Chesapeake Bay in May of the following year, the ships brought 144 ill-prepared settlers to the New World. A site was selected on a peninsula that jutted into a river. Prudently, the leadership named both the town and the river for their benefactor, James I. Less prudently, they selected a low-lying area that was prone to high humidity and hosts of mosquitoes. The isolated location did, however, provide an easily defended position in the event of Indian attack. Jamestown's early history alternated between near disaster and faint success. The root difficulty was that the colony needed soldiers, craftsmen and farmers, but instead was populated largely by self-important gentlemen unaccustomed to manual labor. Energy was wasted in the search for gold and silver, when prudence demanded crop planting. The consequences of such actions were severe. More than one-third of the colonists died during the winter of 1607-08, having fallen prey to malaria, typhoid fever, scurvy, and dysentery. The health crisis was compounded by bitter leadership feuds within the shrinking community. In 1608, Captain John Smith, a soldier, forced his will on the colonists and successfully organized efforts to plant crops and construct proper dwellings. Unfortunately for all concerned, Smith returned to England for medical treatment in 1609. In his absence, the colony reverted to many of its former unfortunate habits. Meanwhile, changes were occurring in England that would impact the Jamestown settlers. The London Company was reorganized and became known as the Virginia Company. A new governor, Lord De La Warr, was dispatched to implement new efforts to populate the tiny settlement. The company introduced the headright system, a series of land-grant incentives designed to attract colonists to Virginia. The anticipated influx of new settlers in 1609 never materialized. One ship was lost at sea, and another was delayed for months after running aground. Disease and a shortage of food greeted those who managed to complete the journey. The fragile stability that Smith had forged during the previous year evaporated and was replaced by the tragic starving time of 1609-10. Native leader Powhatan, the father of Pocahontas, held sway over a loose confederation of tribes from his village of Werowocomoco, north of Jamestown on the York River. The relationship between the natives and the settlers alternated between peace and war, but a potentially fatal blow was delivered by the Indians in a surprise attack in 1622. Only the long-delayed arrival of Governor De La Warr halted the complete evacuation of Jamestown. The later development of a cash crop, tobacco, would begin to provide a sorely needed economic base for the colony. Jamestown's profit problems influenced the leadership in London to liberalize its rules. Among other things, Virginia residents were allowed to own land and enjoy representative government. The House of Burgesses met for the first time in 1619. Its somewhat limited role was to work with the governor and council to form laws for the colony. Conditions were further improved by the shipment of a boatload of women destined to be wives for the settlers. The importation and sale of the first African slaves also lightened the workload. Despite these improvements, the colony was not a financial success. The Virginia Company declared bankruptcy in 1622. Two years later, the Crown assumed full control of the settlement, making Virginia the first of the royal colonies. *A term then applied to much of eastern North America. Love and Hate in Jamestown: John Smith, Pocahontas, and the Heart of a New Nation by David A. Price. A Voyage Long and Strange: Rediscovering the New World by Tony Horwitz. Sea Venture: Shipwreck, Survival, and the Salvation of the First English Colony in the New World by Kieran Doherty. Captain John Smith: Jamestown and the Birth of the American Dream by Dorothy Hoobler.